I’ve been a certifiable scooter crazy person for over a year now. The scooters I like the least still enjoy preference over almost any motorcycle. That is, until I started looking at Triumph. It’s the british thing. I’m such an english petrol-head at heart. From dad’s ’69 MGb GT to my MINI Cooper S, I’m a fan of of pretty much anything UK and internal combustion. A few months ago, I got the Triumph motorcycle itch. With the prospect of selling the Blur, the thought of a Triumph Thruxton was looking very tempting. So I headed down to MotoPrimo in Lakeville, MN and got a test ride on a Triumph Bonneville — since the Thruxton is but a modified Bonneville. I was as excited as I was apprehensive. I’d never ridden a proper motorcycle before. For the uninitiated, the biggest difference between riding a motorcycle and riding most scooters is if and how you shift gears. Luckily for me, my first scooter was a 1979 Vespa P200E, with a 4-speed manual transmission. So left-hand clutch isn’t that big a deal. Shifting with my left foot, rather than my left hand was a bit of a brain stretch at first, but wasn’t that hard to get used to. Once I familiarized myself with the controls and took a deep breath, it was time to head on down the road. A great moment happened just as I was strapping on my helmet for the test ride. They’d brought the bike out front for me, and just as I was about to climb aboard a guy on his way in the door asked me “What year is your Bonneville?” That’s the modern Bonneville’s real charm: it’s authentic style. I’m not going to pretend to give some sort of meaningful review of how it rides. I was so nervous that just hanging on and keeping my mind on what I was doing really commanded most of this motorcycle virgin’s attention. That, and I really have nothing to compare it to. I’ve never ridden a Harley Sportster. It’s such a different riding experience to riding a scooter. Not better or worse, just different. I can say that the Bonneville is incredibly smooth. The power starts low and the torque just pours on eagerly as you open the throttle. The Bonneville’s 865cc DOHC parallel twin was buttery smooth. That feeling of “hang on!” acceleration I got from twisting the throttle made my eyes go huge and my smile go wide. So much fun. Above all, the Bonneville is comfortable. Such a fantastic cruiser. The seating position for all 6′ 4″ of me was just perfect. The Bonneville is also forgiving. It would tuck into turns very nicely, but always with so much reassuring stability. Returning safely to MotoPrimo after about 15 minutes, I dismounted the Bonneville and returned the keys. In the end, I knew my first motorcycle ride definitely wasn’t my last. To this day, I think that there’s a Bonneville in my future. With its authentically classic lines, its very reasonable price ($7299 as ridden), its British sensibility, and the ability to mix and match Thruxton parts at will, I just can’t think of anything I’d rather have in a sporty cruiser bike. I want to ride more motorcycles and I’d really like to ride a classic Bonneville back-to-back. Bottom line though, I think there’s a Bonneville in my garage’s future. Hopefully it won’t get in any mods vs. rockers fights with my Vespa. Hum always wanted a BSA but decided on a Honda CL 72/250 Scrambler back in 1964. I liked the Honda’s more lively styling and action. I found the Triumph a more of a style cruising bike and Hondas more zippy fun. Can’t beat the looks of the Triumph though. 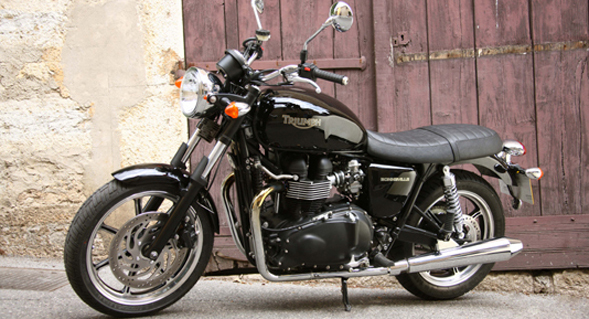 From talking to people who have them, the Bonneville and the Thruxton both are highly capable sporting bikes. One review I read reported how on the day he spent at the track, a basically stock Thruxton was posting better lap times than anything else there that day. What draws me to the Thruxton in so many ways is how it’s the crotch rocket of 50 years ago. The Triumph guy at MotoPrimo also told me that one of the beauties of the Bonny and the Thruxton is that they’re both the perfect match of suspension to power. You can’t really over-ride the suspension, which definitely appeals to me. I’m not interested in the monster sport bikes of today that have as much horsepower as my car. But of course, that’s all conjecture. I haven’t ridden enough different bikes to really know. Different bikes. I am a off road guy and the Triumph would never do there. Back in high school I was a surfer and hare and hound racer and that life style was more suited to the “Scrambler Mentality” and looks that said I’m a crazy guy. The Triumph was more of a Preppie look or as we surfers called them “Soc'” or social climbers. So we had the greasers, who rode choppers surfers who road scramblers, soc’ who rode BSA, Triumphs out here in California. Triumph was undoubtedly a better bike though. Love the review, just like me a scooter freak who has just ordered a new Bonneville 60 from the Leicester factory. Saying goodbye to the Vespa PX200 was hard but after riding the tester Bonnie I just had to have one. I ordered the limited edition 60 in grey/blue and hope it will be my bike for the next 10 years as the Vespa competently did. Delivery is long, ordered in February 2010 and to be delivered in June 2010, why? I lost no money in the 10 years with my Vespa as it became a UK classic and sought after. I am hoping the 60 become collectable but it’s the ride and fun that I’m looking forward to. Have booked a trip round the factory when the bike is being made, this should give me a great grounding in Triumph passion. Will post the story of the delivery and first ride of the Bonneville 60, only 120 to be available in the UK so I feel privaleged already. Wow! Congrats! I’m sure there’s a Bonnie in my future, but I’m going to hang on until I can make it part of a small collection of bikes. Would love to hear from you again after you take delivery. Cheers! At last have gor a delivery date of 4th June 2010. Have booked day off work and kept the weekend free to “learn” the bike on my own. Plan to ride the 50 miles up to our Cumbrian lake district, a beautiful bike in a beautiful scenery go to leave a great impression. Have got new mini video for helmet so will record the whole day to bore the family for weeks! Got the bike last Friday, not been off it. The 500 mile service is sure gonna be quick. The bike handles like a dream, smooth as silk and so well balanced it forgives an old Vespa rider not used to large angled banking over. Only problems was I didn’t order a centre stand, but will get one fitted when service comes around. Power is tremendous in all gears, adds 10 on by a sharp flick of the throttle and so ovetaking is so simple. Mirrors are a bit small with blind spots and ignition place tends to cause keys to scrape left fork. Bike riders today also run cars and RV’s so have wrapped felt around top of fork. Took me a day to get used to foot gearchanging again after 10 year so twisting the left grip, and one down:4 up is new to me. My last bike was one up three down. Now the problem has gone from my brain. I cannot think why I didn’t go Bonneville before today, the fun of riding it and even just looking at it has become a new focus. Went to two bikers hangouts this weekend to discover they are all ex-bikers, reinventing their dreams with new machines.Go for it. How do you send in a picture? Oh wow, congrats, Henry! I’m so jealous. I bought myself a 30 year-old Honda CB650 a few weeks ago for my first motorcycle, which has been super fun. But I’m not going to kid myself that I don’t wish it were a Bonny. Someday, I’ll go down that road, but the economics right now mean an older bike for now. Still fun though. As for a photo, feel free to email it to the address on my About page and I’ll stick it in your comment for you. Thanks for sharing your story!